Who doesn't love a good planner? 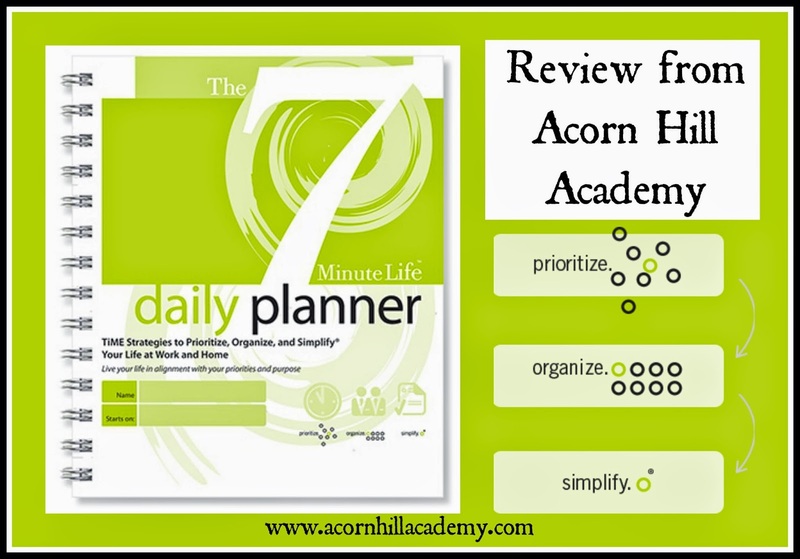 I was thrilled to receive a copy of the The 7 Minute Life™ Daily Planner from The 7 Minute Life to review as part of the Schoolhouse Crew. I am always looking for THE planner - you know, the one that is going to make me organized, efficient and keep me on top of everything. If it came with a SuperMom cape, it would be even better. Allyson Lewis created this planner to help people make the most of their time, after a major health scare in her own life helped her see that every moment is precious. Her goal is to help people achieve personal growth by learning to prioritize and manage their time well. Each book covers 90 days, because life passes in cycles of 90 days - seasons: winter, spring, summer, fall. Allyson chose 7 minutes because most adults seem to have a 7-minute attention span. Once you have seen that you need a plan, and make your goals, you figure out what steps you need to take to achieve them, and schedule them. If you can spend 7 minutes each day planning your next steps, you will know what to do next in your plan. When I first received the planner, I must confess, I was overwhelmed. The videos were very helpful. Each one is short, and the process is broken down into manageable portions. That was so nice. I loved being able to watch one short section at a time, and not get overwhelmed. One thing I'd heard before, but had forgotten and have not been practicing, is that you want ONE place for your to-do lists. I tend to write things down on whatever is available. It might be a sticky note, or a random piece of scrap paper, but they are rarely in the same place, and usually not where I can find them when I need them. Writing everything down in the planner makes life so much easier! Using this planner really helped me identify my priorities and make sure my time was spent working on them. I'd realized over the past few months that the priorities I thought I had were not reflected in what I was doing. I have been able to break things down into doable chunks, and therefore begin to see myself accomplish things. Having specific actions written down helps me stay focused; I'm easily distracted and tend to forget what I meant to do. I love that there is a place to keep track of what I've spent each day. I am not very good at paying attention to that, in general, and it's helped me be much more aware. Support and tools: Allyson has put a lot of time into making videos to explain each step of using the The 7 Minute Life™ Daily Planner, and has made a TON of free resources available on her website. There are getting started videos, and instructions that walk you step-by-step through using the planner. There are videos that cover all the different pages. You can see, and print to try, many of the forms included in the planner on their page of free tools. The plastic covers are determined to curl, and the back covers keep coming off the spiral binding. I pinched the coils together a bit, and that seems to have helped. This planner is intended for business people. I am a stay-at-home, homeschooling mom. I can tweak this planner for myself, but it would be great to have something more suited for my situation. There are twice as many work task pages as home tasks, for example, and there is a grocery list but no true menu planner. I understand the reasoning behind having the planners available in 90-day increments, but I would really rather have a whole year in one planner. That would be unwieldy with the current format. An app version would be great. As much as I love paper, I need as few things as possible to keep track of, so I think being able to use this on my iPad would make it even more convenient - although I would most definitely miss the ability to write things by hand. I think important connections are made when we physically write things, but that is a discussion for another day. I am easily overwhelmed with planning, schedules, time management... I prefer to avoid it if possible. However, in the last few months it has become clear to me that my strategy of avoidance is not working very well. The system Allyson has laid out in the planner, along with the step-by-step videos, have helped me tremendously. I still have a lot of work to do, but I'm getting there, and it's a good feeling. 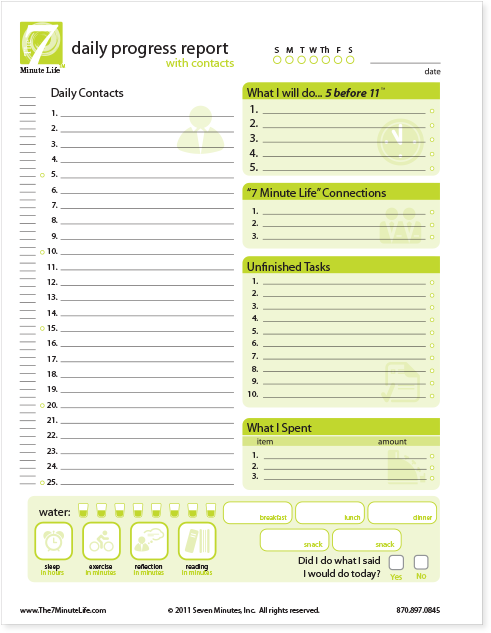 The The 7 Minute Life™ Daily Planner is available directly from The 7 Minute Life. Printed, undated 90-day planners are available for $24.95 each, or you can purchase three printed planners for $74.85 and receive the 4th one for free. Also, you can purchase a pre-dated 90-day downloadable PDF for $9.97. It prints out onto 8.5"x11" paper, so you could have it bound or put it into a binder. I checked into some other planning systems, and while this one seems a little pricey, the free resources available on the website offer much more than I found anywhere else.